NOTE: Sports preemptions may lead to some downward adjustments in afternoon numbers, especially for CW. 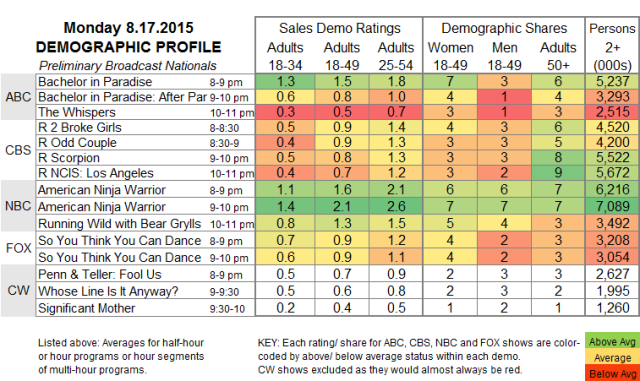 ABC: BACHELOR IN PARADISE was steady at 1.5, and the AFTER PARADISE post-show gained 0.1 to 0.8. However, THE WHISPERS fell 0.1 to a new low 0.5. NBC: AMERICAN NINJA WARRIOR dropped 0.3 to 1.8, and RUNNING WILD lost 0.1 to 1.3. FOX: SO YOU THINK YOU CAN DANCE held at 0.9. CBS: A night of reruns was led by 0.9s for 2 BROKE GIRLS and THE ODD COUPLE. CW: As of now, PENN & TELLER: FOOL US and WHOSE LINE IS IT ANYWAY are up 0.1 (respectively to 0.7 and 0.6), and SIGNIFICANT MOTHER is up 0.2 (to 0.4), but those numbers are unlikely to hold up. Season finales tonight include CLIPPED on TBS and PROOF on TNT.